Once the King of Kale, Whole Foods is now fighting to maintain its share of an increasingly crowded market for healthy food. Whole Foods, the leading organic grocery chain, with 388 stores in North America and the United Kingdom, reported tepid sales growth and a cautious outlook for the next quarter late Wednesday. Shares of Whole Foods (WFM) sank more 3% on Thursday on the news. The stock is now down 35% this year, making it one of the worst performers in the S&P 500. Whole Foods said comparable store sales increased just 3.9% in its most recent quarter. That's far below Whole Food's long-term target of 6% growth. The Austin-based company has been at the forefront of the shift in Americans' eating habits towards organic produce, dairy products from grass-fed cows and non-genetically modified proteins. But as demand for high quality food has increased, so have the number of specialty stores seeking to cash in on the trend. Sprouts Farmers Market (SFM), which went public in 2013, and The Fresh Market (TFM) both compete directly with Whole Foods. Privately held Trader Joe's is also giving Whole Foods a run for its money. Kroger (KR), America's largest supermarket chain, has been stepping up its presence in the organic market as well. So are big-box retailers Wal-Mart (WMT) and Target (PBCFX). 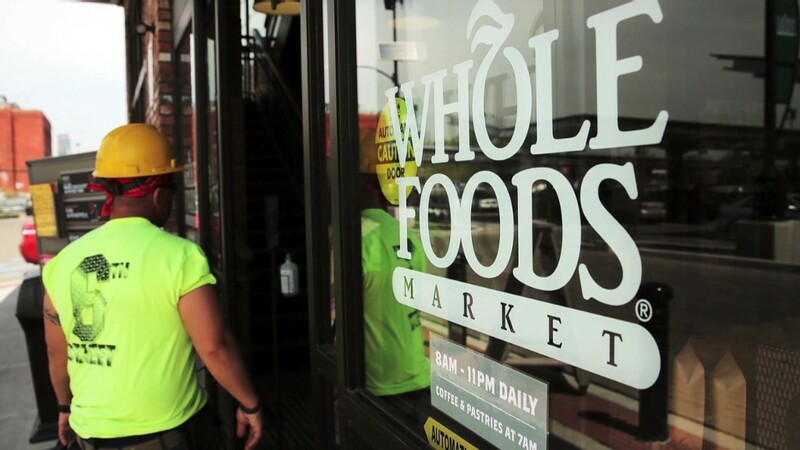 The sell-off has even prompted rumors that Whole Foods could be a takeover target. In response, Whole Foods unveiled a number of new initiatives Wednesday aimed at "differentiating" its brand highlighting its "value" offerings. Whole Foods plans to open a total of 38 new stores this year and will remodel stores that are 10 years old. It is also rolling out a national advertising campaign this fall and is experimenting with home delivery and online ordering. Walter Robb, co-chief executive of Whole Foods, said the company is "seeing signs of stability in our sales trends and our strategic initiatives will help generate further momentum." The company, which some consumers critically refer to as "Whole Paycheck" because of its high prices, has also been opening stores in low-income neighborhoods, including a new location in Chicago. The goal is to help bring healthy options to so-called "food desert" communities and position Whole Foods to benefit from gentrification. "While [Whole Foods] is taking action to address sales weakness, we do not expect progress on these initiatives to meaningfully benefit comparable store sales in the near term," said Joe Agnese, an analyst at S&P Capital IQ. The company did a good job managing its expenses in the past quarter, but the new initiatives and store openings could put pressure on profit margins going forward, according to analysts at Credit Suisse. Even with the recent decline, Whole Foods stock still doesn't look cheap, according to analysts at Jefferies. Whole Foods currently trades at nearly 23 times next year's earnings estimates, compared with about 15 for the S&P 500. Still, some analysts believe the company is moving in the right direction. Kate Wendt, an analyst at Wells Fargo Securities, said the steps the company is taking make the case for renewed sales growth "more credible."